Lake Champlain Summer Arts Institute — CCC Foundation, Inc.
Block 1 - 8:30 a.m. to 10:20 a.m.
Have you ever wanted to create your own blog? Or, have you wondered how your favorite fashion, sports, celebrity, travel, or other blog was started? 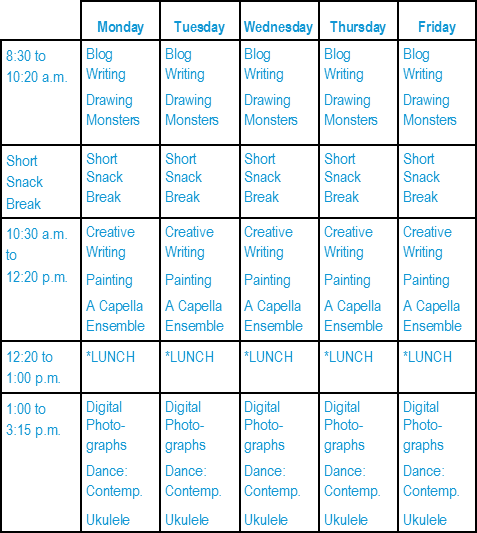 Explore the art of the blog by observing, gathering and reporting information in a week-long blogging project. You’ll learn the basics of blogging and writing for the web while documenting the happenings and student experiences during the week-long arts institute. Come blog all about it! Learn the basics of how to draw monsters! We will explore the principles of 2-dimensional art and use techniques to create realistic 3-dimensional drawings that incorporate tricks like perspective, light sources, and foreshortening. You will learn how to create monsters like dragons, orcs, and zombies! Bring your imagination! Block 2 - 10:30 a.m. to 12:20 p.m.
What was a story you truly loved, one you could not put down? What was a poem that really spoke to you? What made these so magical? We all want to write such moving creative works, but how do we do it? In this session, we will workshop poems and short stories with the goal of helping each other identify and build on the strengths of our writing. Throughout the week, we will complete writing exercises designed to sharpen your writing skills and help generate new work. By the week’s end, you will have developed not only fresh ideas but the beginnings of your next great work. Build your portfolio! This workshop will introduce the fundamentals of color observation and color mixing. Students will create a painting step by step while focusing on color, light source, and shadow. The workshop will be held in a college studio and use professional artist-grade materials and equipment. Let’s paint! Do you like Pitch Perfect or Pentatonix? Talented singers and musically literate students wanted! In this workshop, you will develop an understanding of a Capella and singing technique, perform and choreograph contemporary a Capella-style arrangements, and perform at the end of the week. You will learn what it takes to be in a structured a Capella group while having a blast. Block 3 - 1:00 p.m. to 3:15 p.m. Create art with your digital photographs! Explore the world of image transfers while learning basic compositional and computer editing skills using Adobe Photoshop. Bring your photographic images on a thumb drive; all other supplies will be provided. Love to dance? Want to learn contemporary dance? In this workshop you’ll learn different comtemporary dance pieces and improvisation movements. We’ll work on rhythm, coordination, musicality, and choreography so that you get a sense of a different dance style as you learn a dance piece for performance. You’ll be challenged to think on your feet while enjoying a contemporary dance class. Bring your moves! No, it’s not a little guitar! In this beginner ukulele class, you’ll get in tune, introduce the basics of chords and rhythm while learning to play popular songs. New students and returning students from 2018 are welcome. Let’s have fun! Come Strum! *Please bring a bagged lunch if participating in both the 10:30 AM and 1:00 PM sessions. At the end of the week, a catered barbeque will be held for the students and their families, followed by student performances and a showcase of student work that will be open to the community. After clicking Add to Cart, scroll to the top right corner of the page to complete the registration form and checkout process. Due to limited software capabilities, please keep the quantity at 1 then complete and repeat the process for each separate registrant. We apologize for the inconvenience.